My novel about the Surrealists, Swimming with Tigers, is loosely based on real people and events, but having the latitude to adapt, recombine and invent elements and individuals within the movement made it possible for me to recreate key moments so that they reflect the guiding themes of my book. One of the things I wanted to do was to explore what Surrealism meant for women: whether it provided a rare opportunity in history for women artists to work as equals in collaboration with men, or whether the movement was male-dominated in its membership and in the content of the artworks. A significant scene that occurs fairly on in my book brings all these questions to the fore. The scene depicts the International Surrealist Exhibition at the Galerie des Beaux-Arts in Paris, 1938. This exhibition was a landmark in art history because, instead of following the traditional white walls format, it used the whole environment of the gallery as a canvas and represents an important stage in the early development of installation art. The exhibition consisted of three main arenas, each designed to disorientate the viewer. 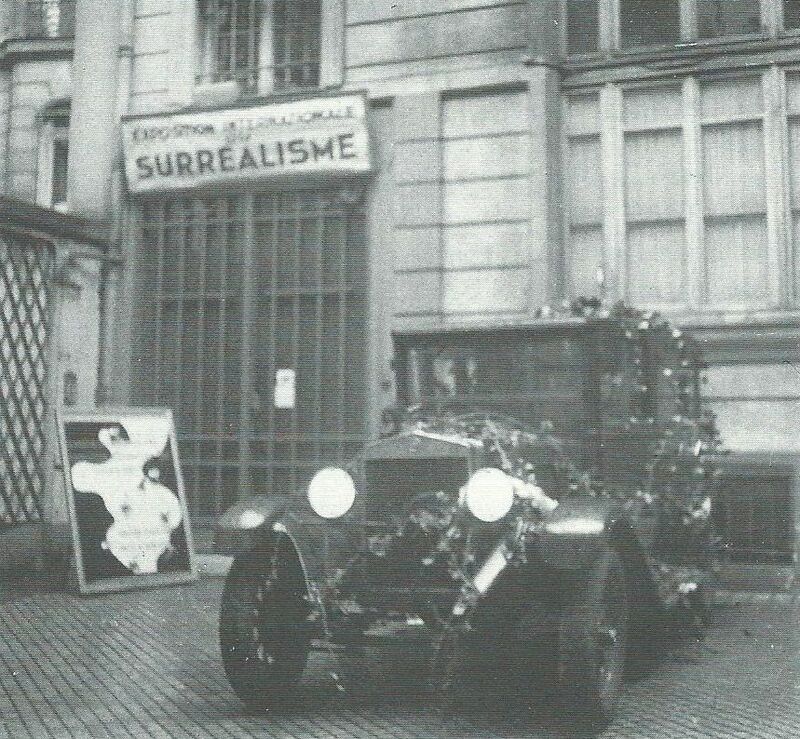 The first was outside, in the courtyard, where Salvador Dali’s Rainy Taxi (now kept permanently at the Dali museum in Figueres) was situated. It is a real black taxi with an interior water-system, and contains life-sized models: the driver has a shark’s head and the woman passenger in the back is surrounded by lettuce and has live snails crawling on her. In my novel I have added live frogs, which Dali did indeed plan to include, and a pile of eggy liquid in the woman’s lap to anticipate the literally sickening conclusion to the scene. 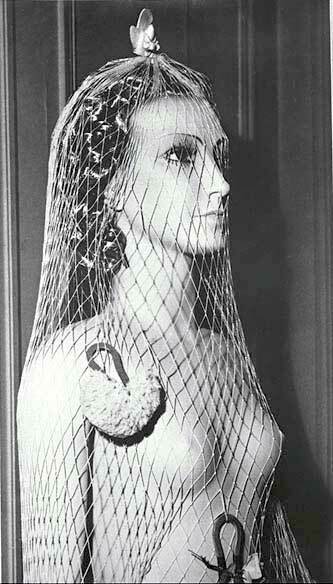 The second environment of the exhibition was a pitch-dark “street” (indoors), lined with female shop mannequins which had been dressed with strange objects and fabrics by individual Surrealist artists such as Man Ray, Yves Tanguy and André Masson (of the sixteen mannequins displayed, only one was dressed by a woman, Sonia Mossè). Spectators walked along this dubious parade of provocative “women” scanning each one with the hand-held torches that were provided as the only light source. The street of mannequins led into the third area, a large grotto containing four large beds, and the similarity to a visit to a brothel was intentional. In this last room, Surrealist artworks were displayed under a ceiling (designed by Marcel Duchamp) of 1,200 low-hung coal sacks. The floor was covered in dead leaves and there was also a brazier and a pool of water. A recording of laughter increased the immersive, unsettling effect of the environment. 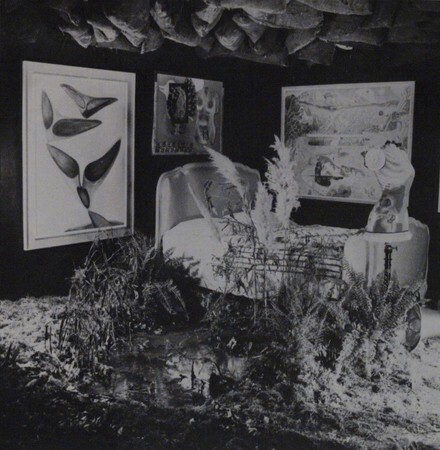 On the first night a Surrealist dance was performed by Hélène Vanel, who tore her clothes, wrestled on the beds with a cockerel, and ended by wallowing in the pool. I kept all these details in my fictional account (although I made up some mannequins of my own). The exhibition is described from the perspective of Penelope, an artist and member of the group whose work is included but who has had no involvement in putting the exhibition together. She wanders through the different spaces with growing disquiet and is sexually assaulted next to the parade of women mannequins on offer to the spectators. She then discovers that her own Surrealist object has been exhibited under a title that has been given to it by another, male, artist. 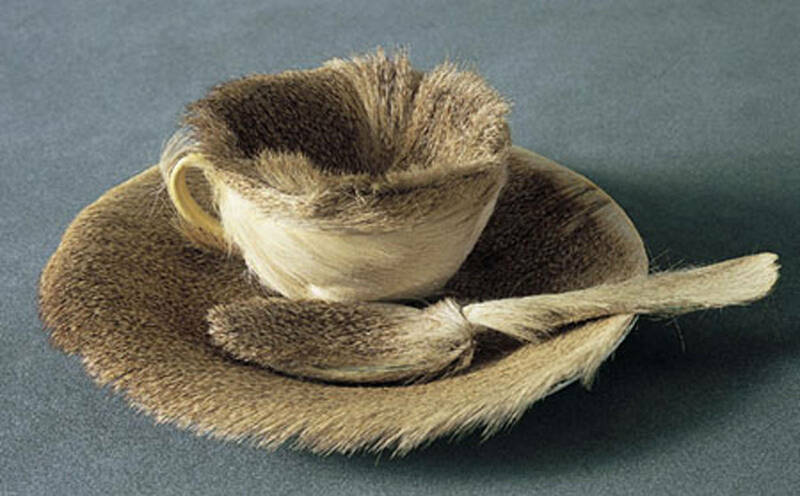 The experience of having one’s work appropriated is drawn f rom the life of Meret Oppenheim, whose teacup, saucer and teaspoon covered with fur, one of the most famous and recognisable icons of Surrealism, was renamed by André Breton, the leader of the movement. Oppenheim’s title for her arresting creation was simply “Object”. In a transgressive act, she turned a domestic item into a fetishistic object, challenging restrictive definitions of femininity. 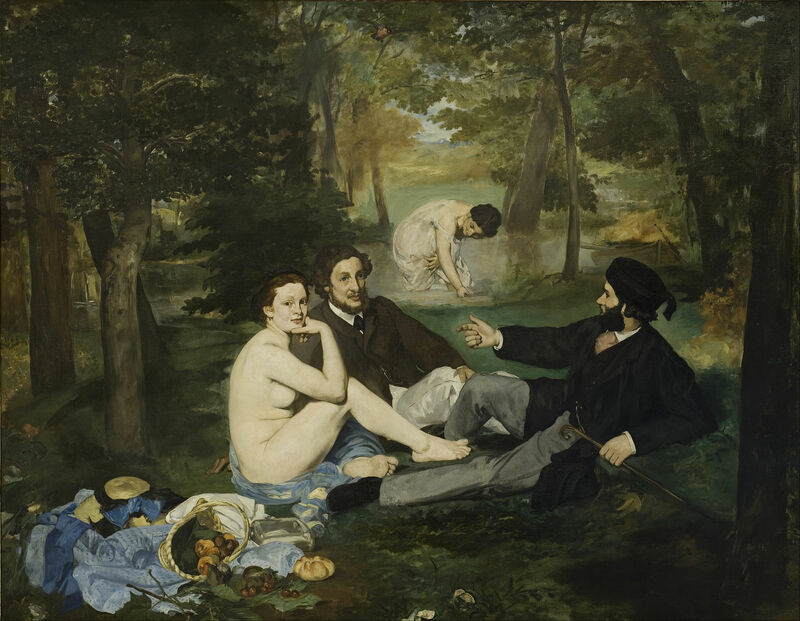 However, when it was exhibited Breton gave it the title Le Déjeuner en Fourrure (Luncheon in Fur) in a deliberate allusion to Edouard Manet’s painting of 1863 Le Déjeuner sur l’herbe (Luncheon on the Grass). In Manet’s well-known painting, set in the countryside, a naked woman is surrounded by fully-clothed men in a coded reference to prostitution in the Bois de Boulogne just outside Paris, and as part of a tradition in fine art painting in which women’s bodies are shown as sexually available and allied to nature. In my version, the fur cup has been renamed “From One Hand to Another”: a title meant to reflect the exchange of women as objects between men, and the extension of this to the works of women artists. It would be giving away too much to describe what impact this experience has on my fictional woman artist, Penelope, but suffice it to say that she does not tolerate this level of control for long. 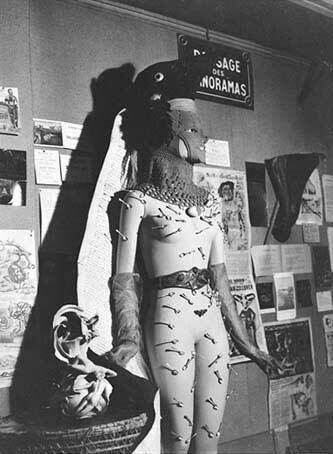 Surrealist exhibitions such as this one in 1938 gave many women (often very young, such as Leonora Carrington who was only 21) the chance to make and exhibit work alongside men. Opportunities for women artists were certainly greater than in any previous (and several subsequent) art movements but the sexual politics of the art was often retrograde and the characteristic tactics of shock and outrage frequently drew on the definition of woman as sexualised object rather than artistic equal. In my novel, I’ve tried to recreate the liberation and excitement that the women artists might have felt at being part of a movement that actively included them, but also their frustration with the regressive sexism that restricted and defined their place.